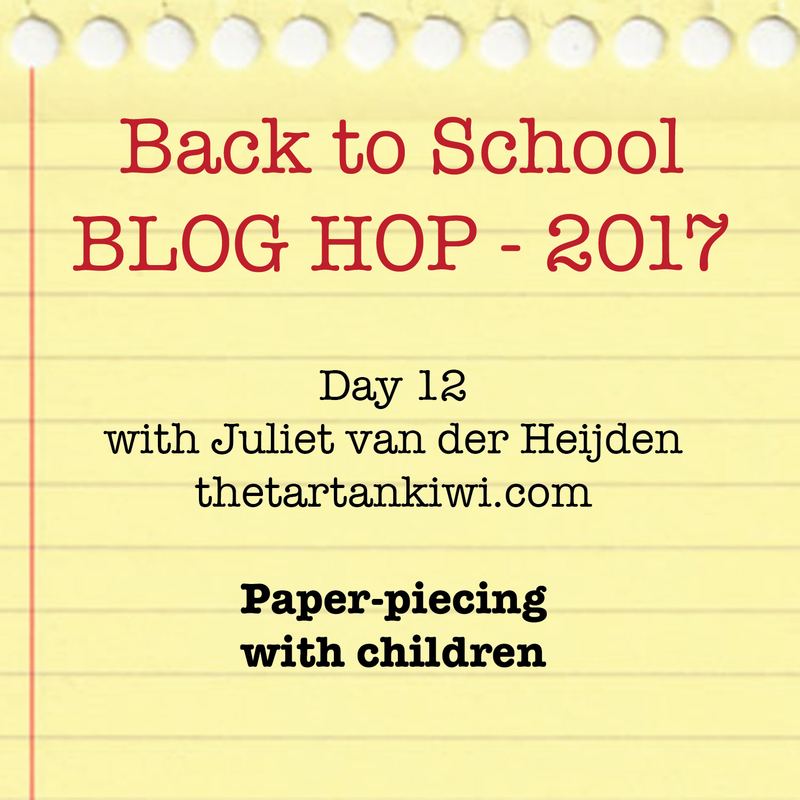 I'm really excited to be participating in the Back to School Blog Hop 2017. Sam of Hunter's Design Studio has lined up an impressive line up of 32 quilters to teach you some handy tips and trick.There is something for everyone, so make sure you go and check them all out. Over the past few months I have been teaching my daughter how to foundation paper piece. 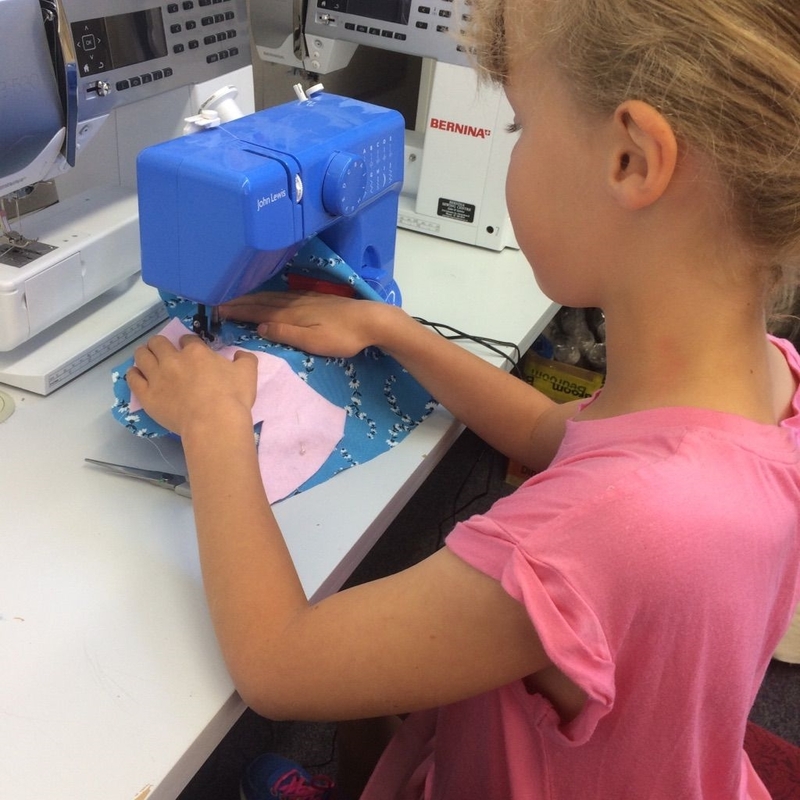 We have both really enjoyed spending quality time together with a sewing machine and we have learnt a few tricks along the way. I thought that it would be fun to share our experiences with you all. I should probably start by telling you that my girl 8 years old. She has grown up watching me paper piece, so she is used to the idea of sewing with paper and fabric. She started to show an interest in sewing a while ago, but her interest really took off when we gave her a little blue sewing machine and an awesome Annabel Wrigley book for her eighth birthday. I am really glad that we made this investment as it has given her independence to explore fabric and has given me the peace of mind to allow her to do it (I would not be comfortable letting her loose on my big powerful Juki). 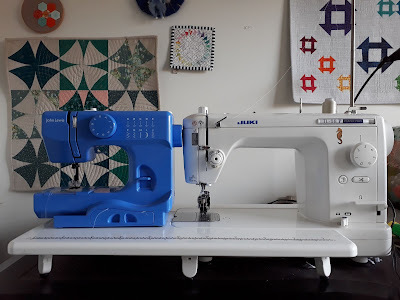 If I'm honest, she is close to growing out of her wee sewing machine, but I am really glad that we bought it as it has proven that she IS interested and that she WILL use a sewing machine if we buy her a bigger one. She has discovered that one of her favourite things to do is to join me in sewing with the Canterbury Modern Quilters Group. Everyone there makes her feel welcome and encourages her. She sees them all as her friends. I want her to be safe. I want her to be successful (too much frustration will put her off for life). My daughter sets high standards for herself and can be hard on herself when she makes mistakes. This is something that I try to take into account when we are sewing together. I want her to set realistic standards, accept that she is learning and be proud of what she achieves. I don't want to stand over her and tell her what to do at every turn. This is not because I am lazy. It's because I think that it is important for her to learn the process of what she is doing so that she can anticipate every step and understand fully what she is doing. I am doing her no favours if I deny her the room to learn and make mistakes. As you can no doubt understand, there is a fine line between too much supervision and not enough. The border will lie in different places for different children. In order to achieve these goals, I have adapted my usual piecing technique. I try to remain flexible and to alter things that I see are not working and I advise you to do the same. Be observant. Pay attention for problem areas and be prepared to experiment to solve any issues that crop up. It is essential that the first pattern that you sew together is not too complicated. I started my daughter with my Kingfisher pattern. It consists of three paper templates, two of which require 7 pieces of fabric to be sewn. The final paper template requires 15 pieces of fabric to be sewn. As well as the number of pieces, consider how easily the sections can be sewn together. Do they need points to match exactly, or does the pattern allow a certain amount of leeway. 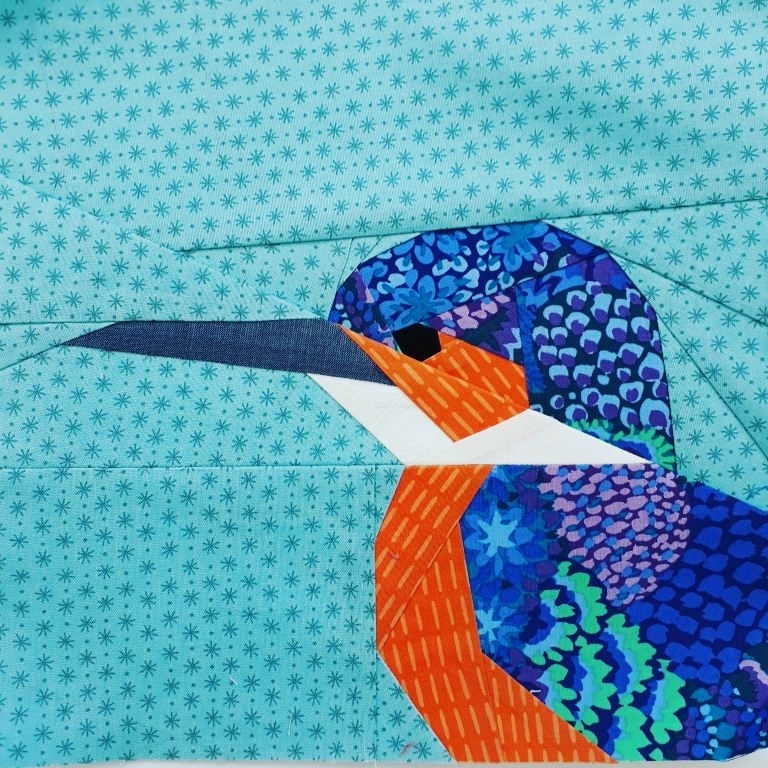 The Kingfisher pattern is one which does not have any really critical join points, and if the pieces are slightly misaligned it is not a disaster. Finally, I would say that you should choose a pattern that your child likes. 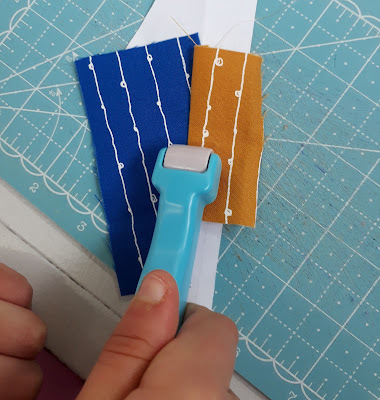 Perhaps you could look out two or three simple patterns and give your child the final decision as to which one they sew. If they are excited about what they are making, they are far more likely to press on and finish. The pattern that she is sewing in the photos is my hedgehog pattern from the Woodland Quiltalong 2. It is more complicated as it has more paper templates and more pieces to sew on those templates, but she loves the pattern and it is a straightforward one for beginners to sew together. So far, she has had no problems with it. Allow plenty of time and make sure that you are able to give your child as much attention as they require. Be prepared to take a step back as they gain in confidence. 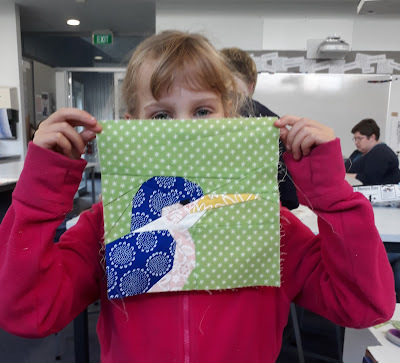 It took three sessions for my daughter to sew her kingfisher- one paper template per session. 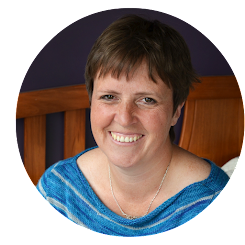 Each time that she started anew, she needed a short reminder as to what she was doing. The reminders became shorter each time. The third pattern piece was the most intensive to sew and she grew a wee bit tired and frustrated by the end. I offered her the chance to stop if she wanted to, but she was determined to keep going. Towards the end, I had to encourage her to go for a run around the block to clear her head. This was supposed to be a fun activity for her, so when it threatened to turn into a battle, it was time for a break and a change of scenery. 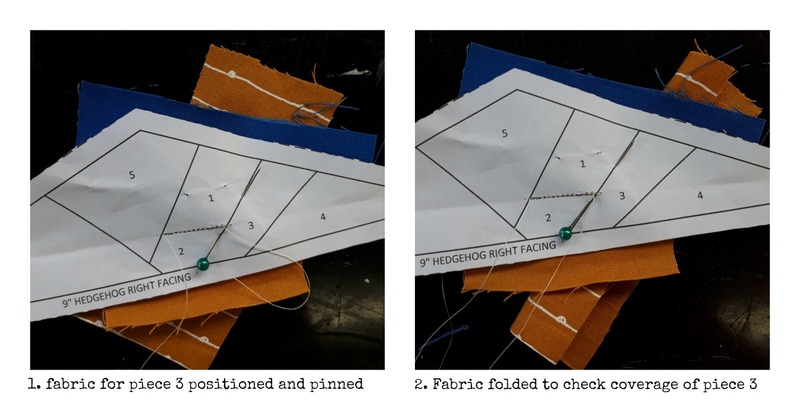 Take a critical look at the pattern before you start sewing. You don't have to start piecing from section A. I would suggest starting from the easiest template, one with the least pieces to sew and the fewest nasty angles. 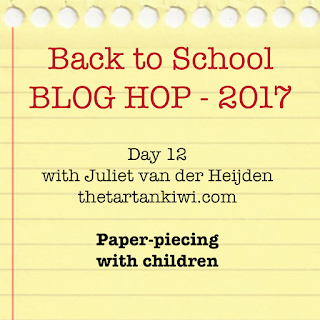 I adapted a few aspects of my usual paper-piecing technique for my daughter in order to make it more appropriate for her age and abilities. At this stage, I have taught my daughter to cut her fabric generously. I am happy for her to learn more about accuracy at a later stage when she is more comfortable with the technique. I would argue that beginners need to learn the logic of the technique rather than worrying about scrimping on fabric. If fabric wastage bothers you, then don't let your child use your most precious fabrics. My daughter has her own fabric stash, but I'm pretty relaxed about giving her access to most of my fabric and she knows that she is welcome to use fabric from my scrap baskets. Remember, if you are stressing about your precious fabrics then your child will feel it and will not enjoy themself. Checking whether the fabric will cover the paper. As I said earlier, avoiding frustration was one of my big goals and there are few things more frustrating than having to unpick the seam of tiny stitches because your fabric doesn't cover the necessary area. We developed a wee trick to avoid this. My daughter would position the fabric, then place a pin along the seam line that she was going to sew. She often asked for my help with this step as she found it difficult to manipulate the pin with the required amount of accuracy. After placing the pin, she could carefully fold the fabric back and see if it was correctly positioned. By so doing she avoided having to unpick too much and also avoided shredding the paper by having to resew seams over and over. Although my daughter is quite possibly capable of using a rotary cutter, I am not yet ready to let her try. I kind of like the idea of her having 5 fingers on each hand! I have taught her to trim her seam allowances using fabric scissors. If anything she errs on the side of caution and cuts the allowances too big rather than too small. In time I will teach her to use a rotary cutter, but for the moment this is ample accuracy for what she needs. When I am paper piecing, I am a bit of stickler for pressing each seam. I love the accuracy that this step gives and feel that it improves my finished result. 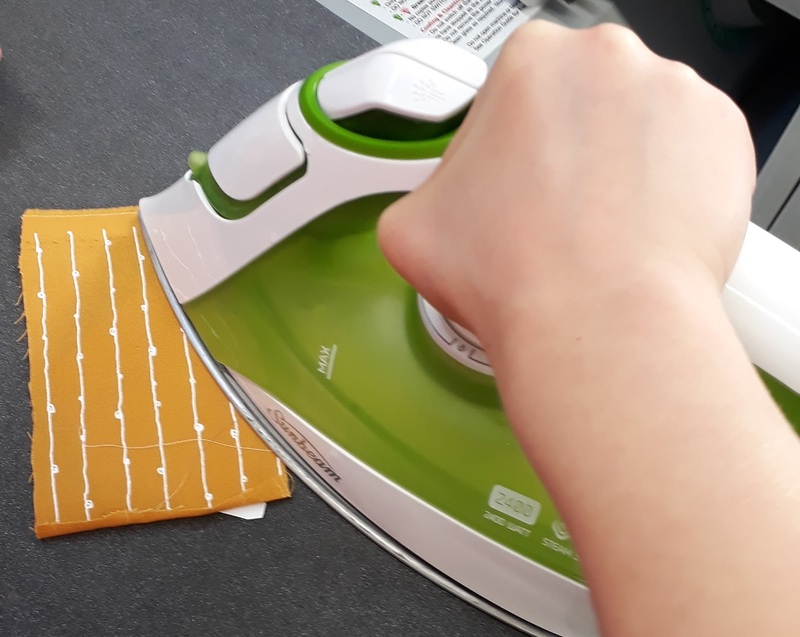 Although my daughter is capable of using an iron, I gave her the opportunity to use a seam roller instead. She loves it and now only presses her seams with an iron when she has finished a complete template. Let's be honest, it can be hard work and a bit stressful sewing with children, but it can also be extremely rewarding and fun, especially if you manage to tailor the experience to suit your child's abilities. I really do think that the most important message of this post is to remain relaxed and have fun. If you can do that, you will be amazed by the things that your child can achieve. You will also gift them a skill that will serve them well in years to come. Great advice! 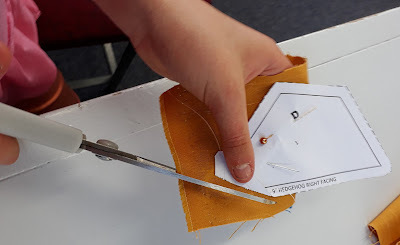 I think some of it would also apply to adult beginners, especially those who are convinced that paper piecing is too hard for them to manage. What a great post! 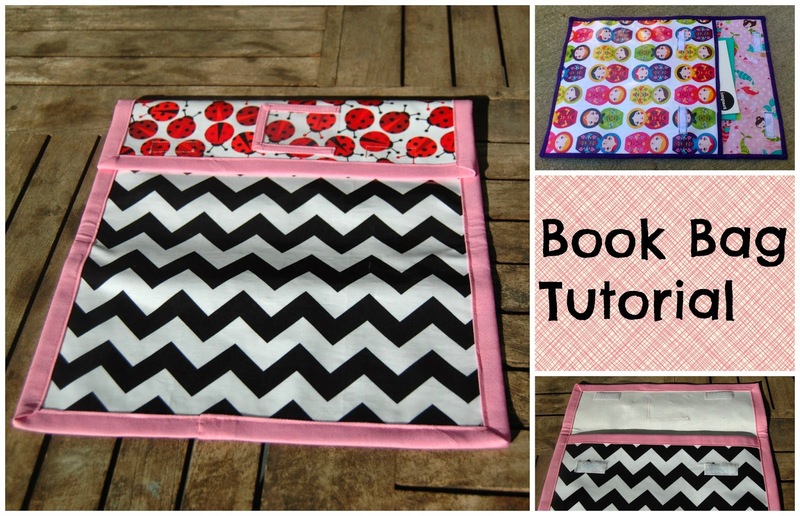 I'm happy for you that your daughter is catching the sewing bug. je suis très contente de vous lire, surtout pour nous montrer comment faire coudre des enfants; je suis grand-mère et ma petite-fille a seulement 6ans, elle voudrait bien coudre mais j'ai peur de la dangerosité de la machine à coudre. p-e qu'avec vos conseils je vais bientôt essayer.